While you might think about the Nature Conservancy of Canada (NCC) as strictly a land conservation organization, we also do a lot of work protecting Canada’s fresh water and coastal habitats. And NCC’s Conservation Volunteers are an important part of this work. Defend land against droughts and floods. Reduce erosion by dissipating wave and current energy. One of the ways to stabilize shorelines from erosion and reduce excess sediments entering waterways is by planting native trees and shrubs. 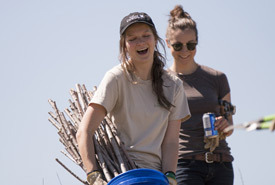 In 2015, Conservation Volunteers from Alberta harvested and planted healthy willow live stakes on three conservation properties in Alberta, including the Waldron Ranch, a site near Big Hill Spring and another along the shores of Pine Lake. Thanks to the 67 volunteers, more than 1,600 willow live stakes were put into the ground alongside a dugout, stream and pond. Hardy species like willow, dogwood and poplar are commonly used in stabilizing riverbanks because they are fast-growing and can regrow roots from branches, or live stakes. 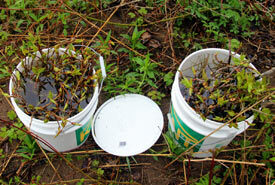 Trees and shrubs growing along riverbanks can establish roots elsewhere when branches break off and float downstream. Livestaking mimics this process. Trees and shrubs along the stream or riverbank also effectively provide shade and cool water, which is important for fish species like native trout and salmon. More recently in May of 2016, a similar planting took place at an important Atlantic salmon river, Crabbes River in Newfoundland. Volunteers planted 200 balsam poplar live stakes along a stretch of the river to control erosion, restore the river’s floodplain and provide a corridor for wildlife like red foxes, snowshoe hare and red squirrels. 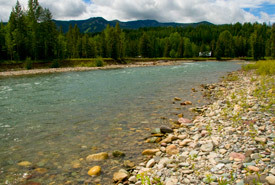 Throughout history people have been straightening streams and creeks to try to get water to drain more quickly. Unfortunately, this drastically alters freshwater habitats. One way to help streams and creeks meander is by installing wing deflectors to recreate the natural bends and diversity of habitats. 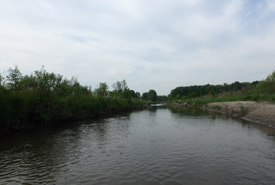 Scientists can design where to place deflectors to best mimic natural conditions by researching how the waterway flowed historically, or by examining other streams in nearby areas. 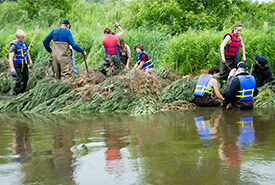 Last year NCC and Conservation Volunteers helped mend Willow Creek, located in Ontario’s world-class Minesing Wetlands. Conservation Volunteers secured the stumps of donated Christmas trees into the creek’s banks, pointing them upstream at a 45-degree angle. Over time, these trees will become creek banks, providing structure to the creek, narrowing the channel and thereby increasing flow rate. This increased flow rate will help flush suspended sediments, deepen the watercourse and cool water temperatures. This will help raise oxygen levels and improve habitat for fish and other aquatic species. There is high ecological value where oceans meets freshwater and where lands meets water, but these places are also attractive for human industry. The Campbell River Estuary in British Columbia is a world-renowned industrial mud pit turned haven for wildlife — a true success story. Where salmon were once scarce, the waters are now their ideal spawning ground. Located in the centre of the estuary is Baikie Island. Extensive restoration work took place to scrape the area clean of its concrete past and to return the shorelines to their former natural contours. This makeover involved digging two new backchannels and replanting native vegetation in marsh and riparian areas. 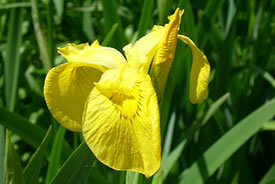 Now, Conservation Volunteers help guard the estuary against invasive species like yellow-flag iris, which can wreak havoc on fragile wetland ecosystems. “Invasives are a big issue around the world. In addition to threatening our native plants and wildlife, the impact of invasive species can result in direct economic losses for people," says Dan Kraus, Weston conservation scientist with NCC. Protecting our waters requires more than just working on aquatic habitats. 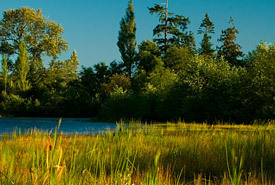 Caring for our lands translates to better health for our waters; they go hand in hand. Thanks to Conservation Volunteers and partner organizations, we are able to care for these sensitive freshwater and coastal ecosystems, from coast to coast to coast.